If you know me (or have read my research website), you know that I study dinosaur brains. 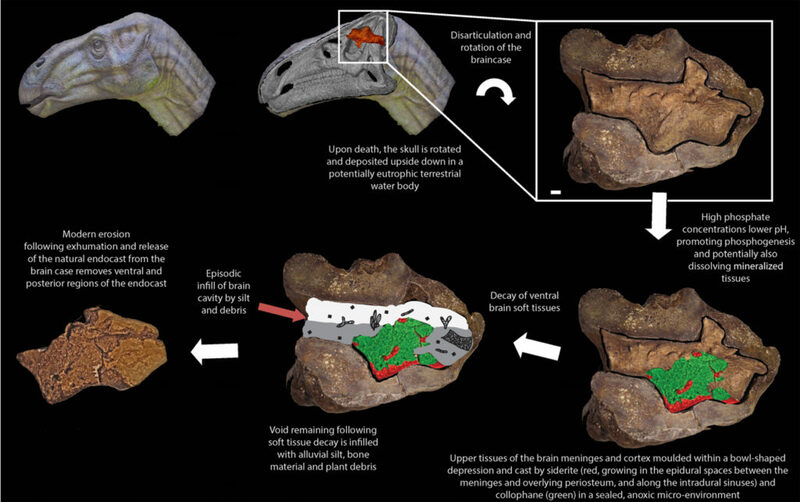 So, a [paper] published just last week about the discovery of a new, fossilized dinosaur brain is perfect for this blog. The paper describes a natural endocast of an iguanodontian dinosaur. What’s a natural endocast? Good question! A cast is a fossil of an infilled space. An endocast is the specific name to a cast made of the inside of the braincase. A natural endocast is an infilling of the braincase that’s made of sediment. Let’s use cupcakes as an example. 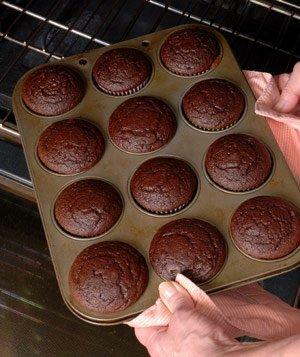 The cupcake pan has a bunch of spaces in it. You pour the batter into the space. When you bake it, the batter hardens in the shape of the pan (just like when sediment turns into rock) and you end up with a cast of the space. In this case, a cupcake. Or, should I say, an endocake? We can also make digital endocasts using CT scanning, which is how I do my research. Very rarely, sediment will fill in the braincase and harden and we end up with a fossilized representation of the inside of the braincase. The brain can sometimes fill in the whole braincase, or sometimes only part of it. Understanding how much of the braincase the brain fills is a goal of paleontologists. Ok, so. This paper describes a natural endocast. The authors used fancy imaging techniques to analyze the fossil. They found something incredible – evidence of tissue layers that normally surround the brain in the fossil. These layers include the dura mater – a tough protective layer around the brain, and a series of blood vessels. Figure 9 from the paper showing how the dinosaur brain was fossilized. First turned upside down in a swamp. The part of the brain that was in the water was fossilized and the rest rotted away and filled with sediments and plants. The authors think that when the dinosaur died, its head fell into a swamp. Swampy water can slow decomposition, and allow soft tissue to be preserved. The brain then slowly started to fossilize. The part of the head that was above water decomposed and filled in with sediment. Then the skull broke apart and left the endocast all alone for the authors to find. However, because the conditions needed to preserve soft tissue are so rare, the paleontology community is a little skeptical about the discovery. Additional analyses are needed to really understand what we’re seeing in this fossil.